Emotional wellness is the cornerstone to a good life,” said Connolly. “Happiness and wellness are attainable right here, right now. Everyone is looking for ways to better their lives, but with the world moving faster than ever, few people have the time to study and internalize complex advice for self-improvement. With more and more people looking for their information on the go, the vast library of books with lengthy, long-winded looks at personal growth are gathering dust on the shelf. Ashley Anne Connolly, M.Ed., LPC, is acutely aware of this. As an experienced psychotherapist, she constantly deals with clients in search of practical and easily manageable tips for improvement. With that in mind, she filled her new book, “Life 101: 21 Practical Growth Principles for the 21st Century,” with concise, immediately useful information, shared in quick bursts. “I feel strongly that personal growth principles are very simple, straightforward and accessible to all, but often the simple ideas get lost in lofty theory or long-winded jargon,” said Connolly. Connolly does not discredit the “lofty theory” that defines many self-improvement ideas. On the contrary, she is focused on breaking down occasionally dense concepts into easily digestible chunks of information that enable people to begin making progress right away. 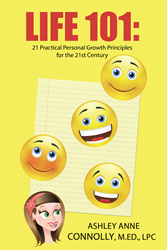 Connolly helps readers avoid feeling overwhelmed by presenting personal growth as a manageable process. For more information, visit http://www.ashleylife101.com/. Ashley Anne Connolly, M.Ed., LPC, is a licensed psychotherapist living in Aspen, Colorado with her husband and two young boys. She earned her undergraduate degree from Northwestern University and her master’s degree in Counseling Psychology from Loyola University Chicago.